The Fuse Factory’s annual juried exhibition proudly presents technology-based new media and digital arts, along with a series of hand-on art workshops and lectures. 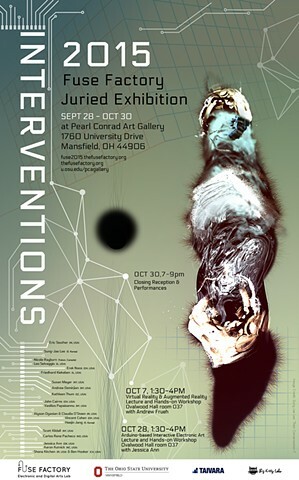 The exhibition runs from Friday, September 28 2015 to October 30 2015 at the Pearl Conard Art Gallery, located on The Ohio State University at Mansfield campus. The exhibition’s closing reception is Friday, October 30 2015 at the Pearl Conard Art Gallery from 7-9pm. The 2015 exhibition explores the theme of INTERVENTIONS featuring artists’ works that examine how scientific methodology intervenes between art and science; how art contributes to scientific research; how technological interventions create artistic spectacles within the intersection of art and technology; the aesthetic discourses between the natural and the technological/”unnatural”; and the use of technological interventions in which organic objects/beings integrate with inorganic mechanical systems and interspecies, to name a few. The exhibition was juried by Tyler Cann (Associate Curator of Contemporary Art, Columbus Museum of Art), Amy Youngs (Associate professor of Art & Technology, The Ohio State University), Alison Colman (Fuse Factory Founder and Executive Director), Kate Shannon (Associate Professor of Art, The Ohio State University at Mansfield), and Doo-sung Yoo (New media artist and curator).